We bought some property today! I am excited because this means that we are on our way to building our house!! The house is still a little ways off but the first step is done!! We have been renting for about 2 years now after owning a home for 4 years. It has been tough going back to renting. We looked for a long time for houses to buy but could not find anything that met our needs or were a price that we wanted to pay. When we saw this lot I just knew that it was the direction we needed to go and so we began the process. So there is a lot of story behind my excitement over DIRT!! Because of this excitement I thought it would be fun to decorate something to put our dirt in and then put it on the mantle. I am sure that my Husband is going to think that I am weird, but that is okay. I took one of my extra embellishment jars and glued ribbon on the sides and made a bow on top. I found some stamps in my stash that I could use to make a tree and the dots! It was pretty quick and easy. I think that the kids will like going and putting a handful of dirt in the jar!! Thanks for letting me share my excitement with you!! Congrats on the new property!! That sounds very exciting Karlee!! Hopefully you can get your dream house built soon!! I'm excited for you!! Squeeee! I am so excited for your family! I think the "dirt jar" is a great idea - I would be excited to see a jar of dirt if I knew it was mine! Congratulations and I'm glad you guys found a place! so happy for you and your family. I don't think I could rent again. Just a matter of time and you will have your home built and ready to decorate. Yah! for you and your family! Your dirt jar is the prettiest dirt jar I have ever seen! Of course I don't recall ever seeing one but if I did it must not have been as nice!!! Congrat! How exciting for all of you!!! Your jar is perfect! What a great idea. I think its great! Congratulations! That is VERY exciting. CONGRATS!!!! Nothing better than to own your own dirt!! 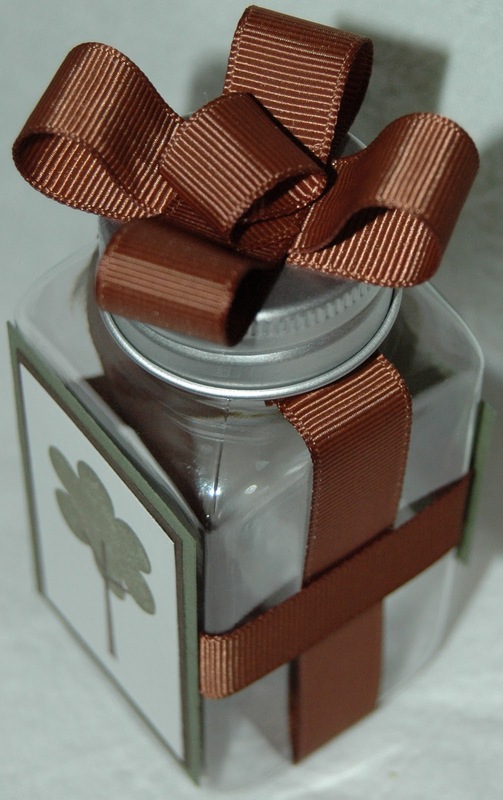 (property) =) Your jar ir a GREAT idea and beautiful!! Congrats again to you and your family!! May GOD continue to bless you!!! Yay! We are in the very beginning stages of building too! We had surveyors out this past week looking at the lot. Your jar is too cute - and totally something I would do! We have pictures of every stage along the way when we built a house. I stood in the same spots each time, so you could really see the progress from dirt to finished. We no longer own that house - but the experience is unforgettable!! I'm really excited for you! What an absolutely wonderful idea!!!!! Congrats on the property! This is such a clever idea! Congrats on your new endeavor! How exciting!! Yeah...dirt! We own dirt too...well lots of dirt and a house...you'll love it! lol I love this idea...and if DH thinks we are nuts then we are doing fine. :) Congrats on the dirt! CONGRATULATIONS KARLEE! What a clever and cute idea of the dirt jar! Congratulations! That is a moment worth remembering! Soooo happy for you, Karlee! I love your idea on showing off your DIRT! I think it is great! You are putting your dream right where everyone can see it. And when you look at it, you just know your dream is coming! Hugs! Congratulations!!! Your husband may think it is weird but I don't!!! I have a rock that I picked up when we first found our property!! Maybe I should make a nice container for it!! Hey, I would be excited about that kind of dirt too. Congratulations! Congratulations Karlee!! We just built our house 2 years ago and wouldn't do anything different. Have fun building!! Congratulations Karlee! That is so exciting...and I LOVE the idea of bottling up the dirt from your lot! What a special way to remember this time in your family's life! Best of luck to you! That is so exciting!! I think it is a neat idea!! Congratulations Karlee! That is so exciting. How exciting - congratulations on your land!! What a great idea, I'm sure the kids will love helping you fill it! How exciting. Congratulations Karlee! And such a great idea. I think the Jar is super cute!! :o) If i ever get the chance to buy land and build a house, I will be scraplifting this idea!! Super adorable! Good luck with the building! Hope it goes well and you get exactly what you want! How exciting! We did this about 6 years ago with wooded acreage and it was the best decision we ever made!! awesome! dirt in our area is mud right now though. lol Congrats on getting property! very excited for you! congratulations! Make sure when you design your kitchen you put in pull out drawers on all the lower cabinets! They will save your back in years to come! Congrats!!! Love to hear the story about your dirt. LOL Remember to plan a big SCRAP ROOM!!! That would be the first thing I would plan. You are too funny! Congrats on your dirt!!! AWESOME~! How exciting for you and your family! Looking everyday at that beautiful jar filled with dirt, is going to be so neat! You are making memories for your kids too! Just think about years from now, you and the family can talk about the day you gathered the dirt, all the planning, the construction, all the decorating and then look at where you are today and reflect! I think that jar will be a mantle piece forever and just full of memories to share. Cool and clever idea! God Bless you and your family! That is great news Karlee!!! Congrats on the beginning of your new adventure! Karlee, I think it's great that you celebrate everything and this is one step closer to your dream. So congratulations on your dirt (lot). How come there isn't any dirt in your pretty jar? Karlee, that is so exciting! I love your dirt jar. I'm so happy for you Karly. Congratulations. 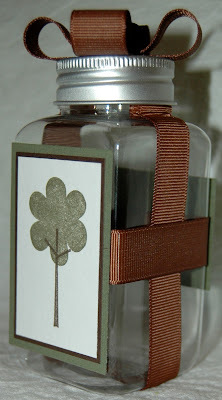 I love the whole idea with the jar. That's a wonderful family thing to do. Your goal will be looking at you every day. I look forward to hearing more of your story. Please keep us all posted. Congrats Karlee! How exciting for you and your family! Best wishes! Now the fun starts, designing what you want! Congratulations, Karlee and family!!! How exciting!!!! Please take us on the journey with you!! Hey Karlee that is how we got our dream house. We started with the land than we built the house at our own pace. We just love it. Congratulations on your dirt!!!! That is so exciting :) Good luck with building your new home! Congrats! That is so wonderful and your idea is precious! Congratz on making the first step in building your home. I think the jar is a super cute idea! I bet the kids will love it. Congrats on the new property! what a cool idea to jar the dirt! Congrats! Have fun building and tailoring your home to your needs!! Yay....what a great idea! Love it...and congrats on your property purchase! Fantastic, maybe take it a step further and plant a tree seedling and watch it grown along with the house? A thought. I think that is a neat idea. I like it! Congrats Karlee. The dirt thing is a super idea. Hubby will appreciate. Wish I would have done that when we built. I have a great story about our House. When my "then" boyfriend asked me to go with him to look at a lot he wanted to build on....HE ASKED ME TO MARRY HIM...by the Lake at edge of our property. That was 10 years ago. Remember...your thoughts today will become Memories tomorrow. Congrats again. (Sorry so winded). Excited for you. COngratulations on your very own "dirt"! That is so exciting for you and your family! 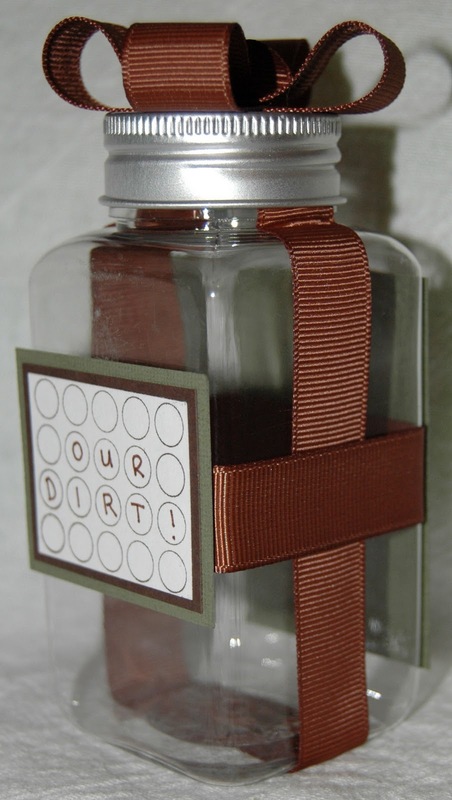 I love the idea of your "Dirt Jar"! CONGRATS on the purchase. What an exciting time for you and your family!!! Best of luck with your "build". Yay, So excited for you. Congrats. Owning your own home is so fullfilling. No words could describe the wonderful feeling of a huge accomplishment. Thanks for sharing and good luck with the process. Congratulations! I'm so excited for you and your family! It is great when you can actually build your house to fit your needs! Have fun and Good Luck with all the planning! Congrads...... how exciting. and for the record I don't think your weird..... I think its a great idea. Yay I know exactly how you feel. we owned a home for 9 years and when we couldn't sale it we rented it out but now we are renting due to not wanting two mortgage payments. It is a very hard transition...So I know exactly how you feel. I will store this idea into the back of my mind for when we finally are rid of the home we aren't even living in lol!! So happy for you! It is such an awesome feeling knowing that it's going to be your forever and you're going to get to watch your kids grow up in your house. Congrats. Congragulations Karlee ! How exciting for you and your family. Congrats Karlee. I am really excited for you. It is a lot of work but it will be so worth it in the end. Do you know where we can order the wobbles. I only saw where you order through google but I can not order that way. Ohhh my that is awesome to hear and what a great idea to put your dirt in I think that is such a neat idea, congrats to you and your family. How exciting! Best of luck. congrats on buying the DIRT, i do love the Jar, I think it is a great idea. Congrats on the dirt purchase although I think you should add the value of the dirt to the jar lol, that would certainly get a reaction from visitors. Ahhhh congrats on your new dirt!!! I love that your kids are going to help fill the jar! This will be a wonderful keepsake! Congrats! I am very excited for you. What a wonderful idea to celebrate this occasion. Thank you for sharing this with us. Yay Karlee! I'm so happy for you. I love your dirt jar. What a great way to remember this day for years to come. Congratulations! Congrats Karlee!!!!! I hope you can soon have your ownhouse. Time fies so you will see soon you will making videos from your own craft room. Lots of luck. Congrats on the new dirt! It is a wonderful feeling! I hope your new home will have a huge craft room in it! By the way, my craft room is purple :D With white furniture and pink accents. congrats that is so exciting! Cant wait to own my first home! What a cute idea. It will encourage you at sometime along the way when things aren't going quite like you want that yes it is OUR dirt. The house will get there eventually. Congratulations, let that jar be a reminder that you have a vision and it is in the process of being fulfilled. It will be a constant reminder. Congrats on the dirt! Really, how exciting to be able to build your own home. I think the dirt jar is a great idea and sentiment. I think that is a real sweet thing for your dirt..
What a super cool idea for your dirt, I love it..How exciting, so happy for you and your family. Congrats on your "dirt" Karlee!!! That's awesome that you are on your way to making your ideal home! I think your jar is a cute idea, and it's probably something I would do as well! Hope you had a totally awesome birthday. I know you are getting ready for CHA. Boy I wish I was able to go and meet Robyn and you . Love you both. Have fun. You are so creative! Love your blog. Hope your birthday was amazing!! Happy Birthday, Karlee! Hope your day is wonderful!!! Hope that your day is great! Hope you have had a wonderful Birthday. Congrats on the dirt. It is an awesome feeling. We got ours about a year ago. Now live in our new home on the lake and we love it. I have used some of my knowledge with my cricut and done some wall designing. looks great. you will enjoy it alot. Hope you get this message. having trouble getting them to post..
you make some really cute stuff.. i like them..
Karlee, I just read that you have a birthday today! Have a super day celebrating you birth and life. You've been fun to follow! How exciting. I am sure you will keep us posted. Good luck. Happy Birthday! What a great way to celebrate with your best friend at CHA. Can't wait to get the scoop from you and Robyn.